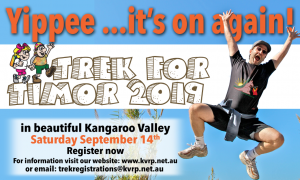 The Kangaroo Valley Remexio Partnership would like to invite our supporters from last year, their friends and families and anyone interested in joining us this year to enjoy the beautiful valley and surrounds in spring. We hope to raise funds this year to continue our student education project, addressing energy poverty and supporting women’s leadership in Timor Leste. You can help us by walking or running 50kms, 35kms or 14kms., and get your friends and networks to sponsor your efforts. Registrations will open in April, so watch this space for more information.